Flexible consumption is far more commonplace than it may first seem, even if the term itself isn’t yet widely used. It refers partly to the “everything-as-a-service” (XaaS) model that has taken over the way that businesses and even individuals consume technology. While corporate IT teams used to be responsible for the maintenance of computer hardware and software, this has now evolved into a model of cloud computing. Enterprises lease computing power on an as-needed basis, and rather than buying software licenses, they pay for access to programs on a time-use model. A 2018 Deloitte study found that businesses were increasingly adopting a XaaS model as a means of accelerating agility, as opposed to merely gaining operational efficiencies. Similarly, for small businesses and individual entrepreneurs, many white label services are now available in a plug-and-play format. Consider Shopify, a cloud-based, hosted commerce platform for opening an online store. If someone has products to sell but no experience designing or developing websites, Shopify allows them to create and customize a store. The service is used by some very familiar names including The Economist, Tesla, and Red Bull. These kinds of services exist all over the internet. Plug-and-play solutions can be found for selling online courses, for consultants to sell time slots in their calendar, and for email marketing, to name just a few. Today, it’s possible to create tokens to represent virtually any real-world asset. They can be traded on virtual exchanges without needing to touch the asset itself until physical settlement is needed. Asset-backed tokens are now starting to reveal their potential to change the way we do business. For a small to medium sized enterprise, security tokens provide an alternative source of funding by selling tokens for shares or existing assets. Asset-backed tokens enable fractional ownership of otherwise indivisible goods, opening up markets to a broader pool of potential investors. Until now, if a business wanted to tokenize assets for sale, they’d have to hire a team of blockchain developers to create tokens on an existing blockchain platform such as Ethereum, involving an outlay of time and money. However, white-label marketplaces, such as the CoreLedger white-label marketplace, now enable businesses to access asset tokenization services on the blockchain only with log-in accounts. With it, any enterprise can tokenize real-world assets without any technical expertise. The service is accessible on an as-needed basis, meaning enterprises can end the subscription whenever they need to. However, the advantages of using a white-label solution in the context of a token marketplace are more significant than for a business procuring an external software solution. Token marketplaces offer the opportunity to generate liquidity. Using a white-label solution allows access to a far larger pool of potential token buyers, meaning the enterprise benefits from the economy of scale of their chosen provider. One example could be the case of a company wanting to raise capital for a new venture or product line. The firm owns an office building, so the management decides to tokenize part of the value of the office building and create a property exchange for trading the tokens on the marketplace. The business raises funds needed for the new venture and avoids the interest it would otherwise have paid on a mortgage from the bank. On the other hand, more people are opened to new investment opportunities from the fractional ownership which is enabled by tokenization. As a result, the company can raise capital with lower transaction cost and larger investor pool. Businesses subscribing to a decentralized white-label marketplace can take advantage of speed to market. Once the tokens are up for sale on the marketplace, potential buyers in the marketplace can see the offers as fast as the blockchain transacts. Not only businesses can benefit from tokenization, but more people can gain access to investment opportunities through fractional ownership. For example, a young couple who are saving to buy their own property, knowing that real estate prices in the area around the office are likely to rise due to the construction of a new high-speed railway track, they decide to invest some of their savings into the real estate-backed tokens. When the property increases in value, they will be able to sell their tokens at a profit and buy their own home. If the business wishes, it can repurchase those tokens, or allow them to be traded with another buyer. An art dealer is another example of an enterprise that could benefit from using a white-label decentralized marketplace. One challenge of selling art is that there’s only a small base of potential buyers — galleries or collectors — making art an illiquid asset. Tokenization enables the division of otherwise indivisible assets, which increases liquidity. Therefore, an art dealer could set up an art-backed token exchange using the white-label marketplace. Once an individual piece of art has been valued, the dealer creates a fixed quantity of tokens, each representing an equal share of the work. By selling the tokenized art in smaller increments of lower cost than a whole piece, the dealer can more easily find buyers from a pool of interested investors on a decentralized marketplace or connected marketplaces. These examples illustrate the immediate benefits of asset tokenization in a business context. However, there are broader benefits to users of a white-label marketplace, particularly for small and medium-sized enterprises. Compared to a customized blockchain solution, using the white-label solution is extremely cost-effective. It’s designed to be easy to use and easy to adopt. Therefore, business could have their own branded token marketplace up and running very quickly. The marketplace also provides a high level of flexibility, as clients will benefit from digital asset directory that covers a diverse range of business use cases. Digital asset directory is acting as a prospectus for investors, while each token’s information is recorded on blockchain and it cannot be falsified. This provides transparency and reliability on the digital asset. Putting prospectus on blockchain requires a big development effort, with a white-label solution, a single enterprise could run multiple exchanges for tokens backed by different assets. If it decides to convert all tokens for a particular asset back into physical form, then there is no ongoing obligation as the changes with the tokens will be recorded on blockchain that they have been redeemed, in most case, the tokens should be destroyed by the issuer upon redemption for physical assets. 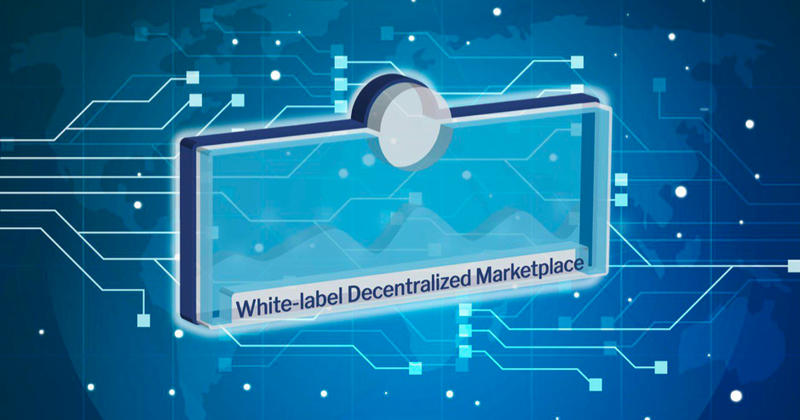 The white-label marketplace provides businesses of all descriptions with an extremely flexible and cost-effective means of creating liquidity. This could mean liquidating existing assets in the form of tokens without having to go via a broker or a bank, creating higher returns. Alternatively, trading asset-backed tokens can bring increased liquidity to dealers and brokers in markets for real-world assets that have traditionally been illiquid. White label services have enabled a new generation of entrepreneurs to realize their business vision without the need to invest valuable time and financial resources. With the availability of more reliable decentralized white-label marketplaces, small and medium-sized businesses are provided the unprecedented potential of asset-backed tokens.